Stafford, VA. A suspect was arrested for driving under the influence on Sunday by deputies with the Stafford County Sheriff’s Office after taking his friend’s vehicle without permission and striking a water pump. On April 7, 2019, at approximately 1:56 a.m., Deputy Aubrecht responded to a reported disturbance at a residence located on the 500 block of Widewater Road. Upon arrival, the deputy made contact with a male subject who advised that his friend had been drinking at the residence and then took his vehicle without permission and struck a water pump pipe on the property. The suspect then drove down Widewater Road before returning to the residence. Deputy Aubrecht located the suspect behind a fence on the property. 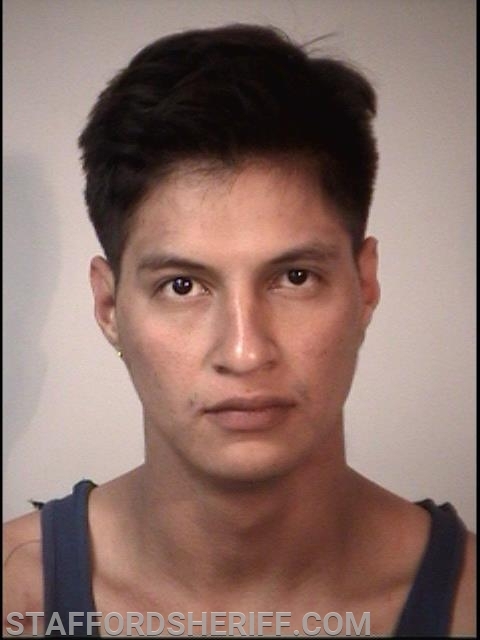 He was detained and identified as Luis Fernando Mendoza Lopez, 25, of Stafford. The deputy then located the vehicle and found the suspect’s identification on the passenger side floorboard. There were also muddy tire tracks in the yard, and mud caked on the tires. The suspect admitted that he did not have permission to use the vehicle and was drinking right before driving. His eyes were bloodshot and glassy, and the strong odor of an alcoholic beverage was emanating from his person. A breath test was administered. The suspect was taken into custody and incarcerated at Rappahannock Regional Jail on charges of driving under the influence, destruction of property, and unauthorized use of a motor vehicle.